How to attract more women to highly-qualified jobs like STEM (Science, Technology, Engineering, Mathematics)? How to tap the female potential more for all major decision-making processes in society? 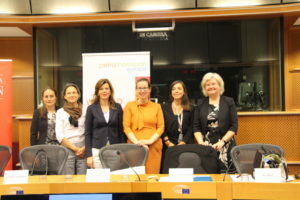 These were just one of the two topics discussed during a high-level roundtable entitled “Gender equality from different angles of society” organised jointly by EU40, the EP´s multicultural cross-party network of young Parliamentarians, and Petrochemicals Europe at the European Parliament. Hosted by Croatian Social Democratic politician Biljana Borzan, it brought together more than 50 participants from the EU Institutions, permanent and regional representations. Petrochemicals Europe´s Executive Director, Dorothee Arns, was invited as female role model to present the perspective of a highly technical sector, publicly perceived as “typically male”, and took the opportunity to position the industry as modern solution provider for many societal challenges, while highlighting the many initiatives it has developed in terms of equal opportunities. Together with a very active audience, Dorothee and senior representatives from the Austrian EU-Presidency, the Commission, the European Council and the International Labour Organisation (ILO) discussed how to close the still largely existing gender pay gap, possible solutions to prevent glass ceilings and unconscious bias, better access to the labour market in general and to top management positions in particular, as well as diversity and inclusion principles. It emerged clearly that these issues are very high on the EU agenda, and this is a societal issue, rather than a female topic. All studies show that diverse teams perform better so that there is also a strong business case for implementation – a point made by Dorothee. Specifically on STEM education, bilaterial follow-up talks were agreed between the EU Institutions, ILO and Petrochemicals Europe.